Description: Belgian endive is a white-leafed vegetable belonging to the daisy family. Often prepared raw in salads, Belgian endive is very versatile and can also be grilled, steamed, boiled, and baked. It has a somewhat tangy and bitter taste and it is said the whiter the leaf is, the less bitter it will taste. It is somewhat labor intensive to grow and is either grown indoors or underground in absence of sunlight with only the tips of the leaves above the soil. . 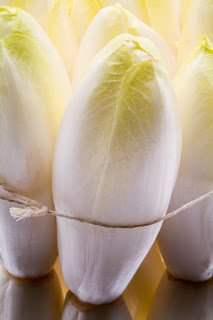 Kitchen Pharmacy: Belgian endive is a tremendous source of fiber as well as folate which helps prevent birth defects. It promotes good vision and fights cataracts and is even believed to help prevent alzehimer's disease and prostate cancer. It is also seen as a tremendous boost to the immune system.